Here’s the deal, you can’t actually make homemade Frank’s Red Hot Sauce. You can make a very similar cayenne pepper sauce, but it won’t be the same. You don’t have a giant factory churning the stuff out, and you probably don’t have the time to age your cayenne pepper sauce, either. This copycat recipe will be close enough. Sea salt (preferably.) Regular salt will do if you don’t have any of the fancy stuff. Wash your peppers and cut off the stems. Use a bunch. For the sake of this recipe we’re going to be using twenty. Throw them in a saucepan and add about two cups of white vinegar, half a teaspoon of sea salt, and three chopped garlic cloves. Bring everything to a light boil and reduce to low heat to simmer. Simmer for about 10-15 minutes, or until the peppers are very soft. Pour it all into your handy dandy food processor and blend extremely well. Super extremely well. Frank’s Red Hot Sauce is basically liquid, so make sure it’s completely smooth, and very thin. Make sure you keep what the strainer pulls out, you can use it as an add-on for other hot sauce recipes. Because this hot sauce is loaded with vinegar you can store it in the fridge for an extremely long time. 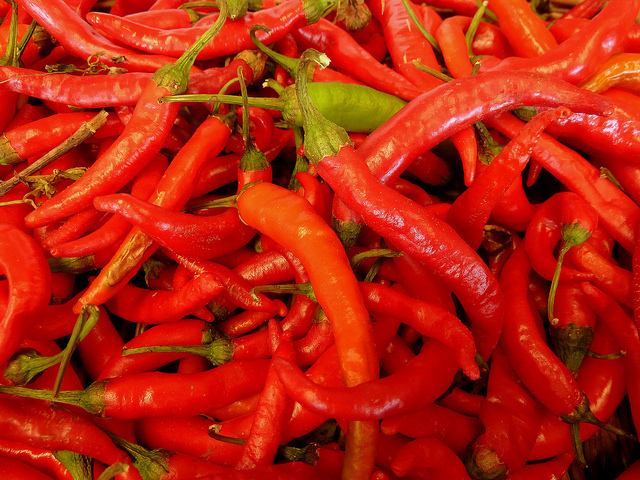 Many hot sauce recipes started out as a preservation method for fresh hot peppers. If you prefer a thicker, hotter sauce, try out this recipe for Homemade Habanero Hot Sauce. There’s also a slightly mildly version here, for Jalapeno Hot Sauce. The peppers have seeds in them. No mention of removing them, so I’m assuming we cook the peppers, seeds & all, right? Where are folks able to buy red cayenne peppers? I can’t find them anywhere – local grocery stores, specialty food markets, vegetable wholesalers, etc. Are red cayenne peppers the same thing as red chili peppers? You are my hero ;). I am going to preapare it , and use it this coming sunday for the Super Bowl game. Will let you know.